Hardback. New. A beautiful hardback edition of the classic Discworld novel'Anything you do in the past changes the future. With the best and most interfering minds of Unseen University somehow left in charge at a critical evolutionary turning point, the Discworld's last continent needs a saviour... Who is this hero striding across the red desert? Doubleday UK. Hardcover. 0857524143 Brand New ,Original Book , Direct from Source , Express 5-8 Business days worldwide Delivery. . New. London : Victor Gollancz. This is a Fine Copy of this Book in publisher's original orange coloured illustrated boards and issued without Dust-Jacket.There are NO previous names or inscriptions present.The book has a firm binding with no loose pages.Clean bright copy internally for the collector of this reproduced series of discworld novels by Terry Pratchett and published by Gollancz.8vo 298 pp First Edition Thus and 1st Impression number line reads 13579108642  . Fine. Hardcover. First Edition Thus Thus. 1st Impression. 2016. Doubleday UK. Hardcover. 0857524143 . Very Good. 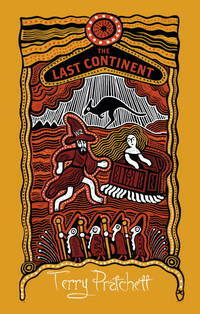 Terry Pratchett - Last Continent - Paperback. Book. BRAND NEW. 2016-11-22. Good. Ships with Tracking Number! INTERNATIONAL WORLDWIDE Shipping available. May not contain Access Codes or Supplements. May be ex-library. Shipping & Handling by region. Buy with confidence, excellent customer service!